I've really enjoyed the little 250, even if it actually is 280mm motor to motor and I only have the 1806 motors on it with the older "simon series" esc's (which are actually running blheli) that can't do damped light. It's not cutting edge performance, but it's still enough to have a lot of fun with and I have had a LOT of fun with it and it's survived with nothing more than a few scratches. It's not as cheap as a ZMR but not as expensive as a blackout - but I'd say you get a lot for your money and it's a nice reliable little flier for me. So...a few weeks back as he was starting his build Airhawk asked me what I thought of the new "280 pro" version. My first reaction was only slightly better than "Uh, I don't know hadn't heard they had a new version" I took a look and saw some interesting changes had been made. 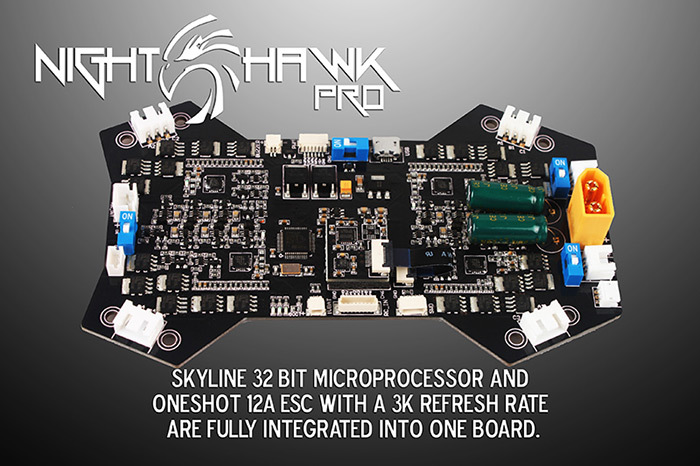 Namely it's now an ARF or RTF, the frame is a little different, and the biggie - they went with an AIO (All In One) board design incorporating emax's version of a Naze32 along with 4 ESC's and power distribution all built right into the base plate. I was torn. It's something I've wanted to do myself for some time. But it also concerned me - what if you burn out an ESC or want to switch to different ESC's? Under the manual the quad was indeed almost ready to fly and well packaged. It's a cardboard cradle not Styrofoam so nice and recyclable and kept everything nice and safe for it's overseas journey. 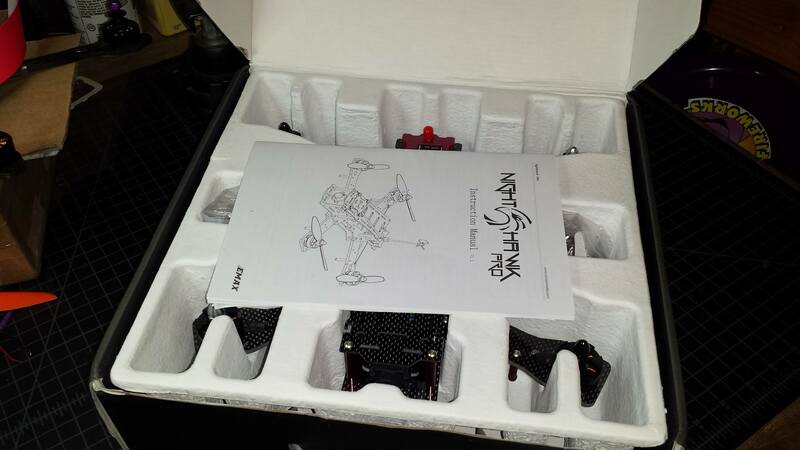 I'm guessing the RTF version has a different box since I don't see anywhere they could fit a TX into this package. Pulling it out I was surprised at how much extra stuff was included for an ARF! Two bags of bags of parts were included tucked mostly into the big open space available in the middle of this quad thanks to the AIO board. I'm still not 100% sold on this tight of integration in a race quad - but have to admit it does make for a VERY clean build. A: Propellers - 6045's of unknown manufacturer. I'm trying to track down what they are and where I can get more though as I quite like them, again more on that later. B: Battery mounting strap, velcro, and a bit of expanding wire mesh to cleanup the RX wiring. C: A number of pigtails to connect to the tiny connectors used on the AIO board. E: A USB cable. I've got plenty but can always use another! And given how many people have problems getting Naze32 boards to talk to their computers with cables they have laying around it's probably a smart touch for them to include it. It's a rather nice USB cable too, not too long - not too short and with a nice big easy to grip end for connecting to the AIO board. F: RX antenna mount. Not really useful with the RX's I have on hand but looks well designed for the common FrSky RX's most people are flying right now. It's a little plastic mount and two straws. I'll take a closer look at it a little later. G: Mobius mount - the bobbins are a little stiffer than the ones that came with my 250 and the plate is just G10 not the hybrid G10/CF used on the rest of the frame and on the mount on my 250. Honestly on a piece like this the hybrid material is just for show and isn't even visible most of the time so I have no issues with it being "just" G10. 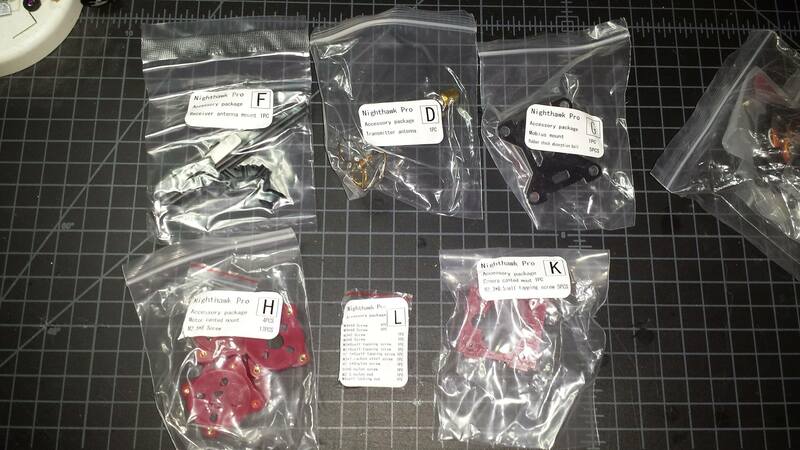 H: Motor tilt mounts. I though these came pre-installed on the ARF - was quite happy to see they come separate as I really want to try flying without them first. Bags I&J are apparently only for the RTF version and are not included in the ARF kit. K: Camera tilt bracket. Non-adjustable but looks functional. I'm more likely to try this before I try the motor tilts but will be interesting to compare both options. So that's how it comes out of the box. Not a bad setup. I personal enjoy building but know a lot of people don't and am sure they'll reach a large audience with the ARF/RTF combo offering. With the ARF there's still enough "assembly" required that this isn't really a kit for someone just getting started with the hobby. I'll get into that more in a later post. For someone with a little bit of experience or willing to dig in but not wanting to do any soldering - this is definitely a nice place to start. Alright, big picture quick look out of the way let's get into some details! The AIO board is what really sets this quad apart so let's take a look at it next. 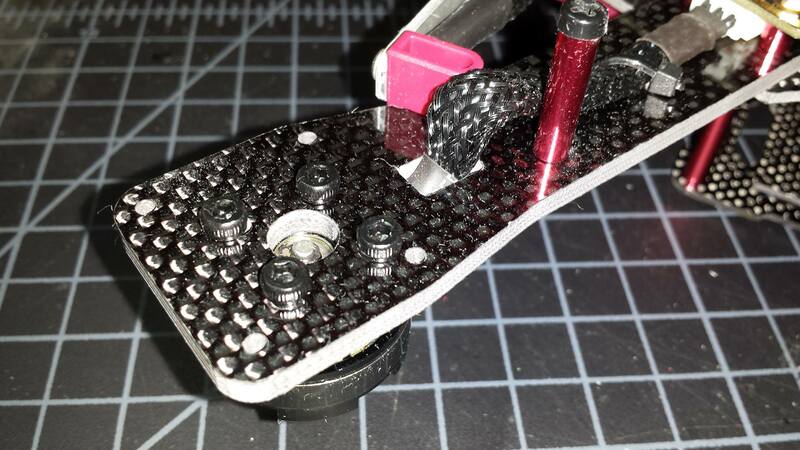 At first glance I was nervous with it being the bottom plate as the motor connectors solder joints and the XT60 main power solder joints look fully exposed. Based on photos I'd seen I was fully anticipating giving this a good coat of liquid electrical tape before flying. But instead was pleased to find that it's covered in a clear conformal coating to insulate it. That is kind of hard to show in photos though. Do note the ferrite on the power leads for the VTX to help cut down interference and the same stubby landing gear that was on the 250. My landing gear on the 250 fell off in flight the first week I had it - these seem to be attached tighter than I was able to get the ones on my 250 (without stripping threads at least) so hopefully they'll last a bit longer. Trying to get a shot that shows the coating on the board is tricky. I played around with lights and flash quite a bit but this was the best I could do. It appears to be brushed on as I can see what look like brush strokes in it but the photo doesn't really show that. It does cover all electrical connections on the bottom. The board itself looks well made but I haven't taken the quad apart to take a close look at the top just yet - I want to give it a few test flights before doing that. It's certainly thick material and seems to be quite hefty - The CG on this feels really low with most of the weight in the AIO board and motors. The arms are considerably wider than the 250 and are solid with no cutouts. I think this is a recent change as other photos I've seen of this quad the arms did have cutouts and some people complained of broken arms. Unlike the 250 the arms are only drilled for the larger bolt pattern used on 2204 motors - 1806's won't fit unless you drill your own holes. The arms are the same thickness as those on my 250 but are far more substantial. They're a different bolt pattern where they attach to the frame as well so it doesn't look like it would be easy to swap the older (probably lighter) arms onto this frame. The motor wires are nicely protected with wire mesh and heat shrink - very clean. The VTX is the one thing that really concerns me the most about this quad. I love that they added antenna holes in the top plate. But then they went and mounted the VTX out here with the antenna attached directly to it fully exposed in a crash. I don't expect the VTX to survive many crashes before the SMA gets broken off. I'll have to take it off and take a close look to see how much support there is - maybe that plastic housing has more thought into it than it appears. The little switch on the side controls the power output of the VTX 20mw default or move the switch to the back and go for a full 200mw. Between the switch and the replaceable antenna I don't think that has any chance of passing part 15 approval with the FCC - but it's nice that they at least give the option for people without a license to try and stay within the spirit of the law if not the letter. Also on the back is the light bar. It's a COB light and it's a monster. The manual says it draws 4watts and warns not to touch it because of how warm it gets! There's a small switch on the AIO board you can use to turn the light on and off - and at 4 watts I'm glad they include that as that's enough it could impact flight times a little bit. As with everything else the wiring is done nice and cleanly with wire loom and heat shrink. The wires terminate in a plug so the light bar is easy to attach/detach. It's held on with two plastic mounts that screw to the rear arms. One slightly disappointing thing is that only the rear arms are drilled for this - so no swapping a front arm to the rear unless you want to give up the light or drill a new hole yourself. Seems odd that they'd do that - I would think making all the arms identical would make manufacturing easier. I wonder if it's an oversight due to the change in the arm design. I'll cover more details over the next few days. But let's take a moment to compare this to it's predecessor the nighthawk 250 next. The arms however are noticeably different. I already noted that they're wider and solid with minimal cutouts. But seeing them next to the 250 arms really shows just how much wider they are despite being the same thickness. There's also more material around the motors on the new arms. I suspect this was done to accommodate the tilt mounts - but also provides a bit more protection for the motors in a crash. On the 250 arms 2204's would be right to the edge of the frame and get basically no protection. I don't much care for the look of the new arms, they do seem more substantial but since I've yet to break an arm on the 250 I'm not sure how warranted that is. Side view is where things really look different. The AIO board really makes for a super super clean build compared to the jumbled mess on my 250! Yeah, I can clean that up a bit better, and with the video gear removed my 250 is really clean. But fitting the ESC's into the 250 was tricky and the power board and FC take up a good bit of space. I would have rather seen the built in ESC's rated for 20A than 12A (especially with 2204's and 6045's) but emax 12a esc's do seem to hold up to that setup so I'm not really anticipating any issues. With outside temps over 110F right now I'm sure I'll uncover any heat issues when I do my test flights! Where's all the extra weight on the 290? I'm really not that sure yet. The props weigh the same as HQ's at 5g (though that's one 1g more than the FC's I fly most often) the 5" DAL props on my 250 are a measly 2g each though...so that's a 12g difference but the overall difference between the 290 and 250 is still more than I'd expected. I'm sure the 2204 motors are heavier than my 1806's. I'll have to weigh one of the 2204's to compare after a few test flights. I also suspect the COB light is a bit heavy - I will probably take it off before the first flights just so I don't risk breaking it while messing around and tuning. 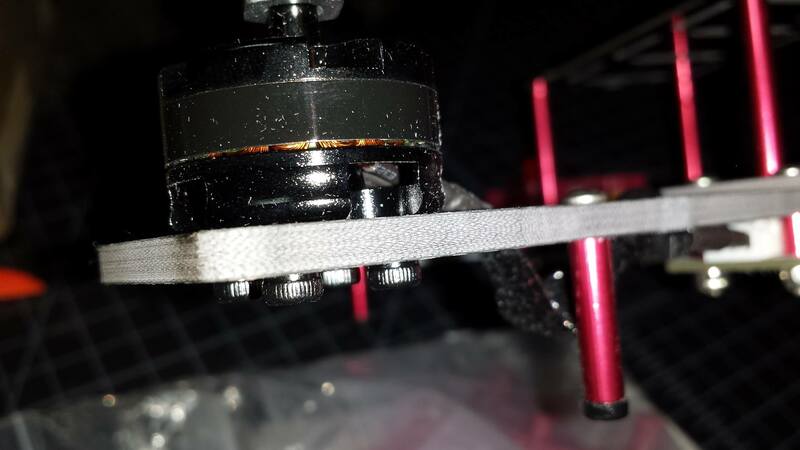 The plastic housing over the VTX probably adds a few grams as well. But I really expected this to be lighter due to the AIO board eliminating almost all wiring. It will be interesting to tear this down and see where the weight is coming from. Speaking of tearing it down some of you are probably already thinking what I'm thinking...take that top off and fly it as a convertible! That does make the VTX even more exposed and raises some camera mounting issues...but yeah, it's something I'll probably try at some point. 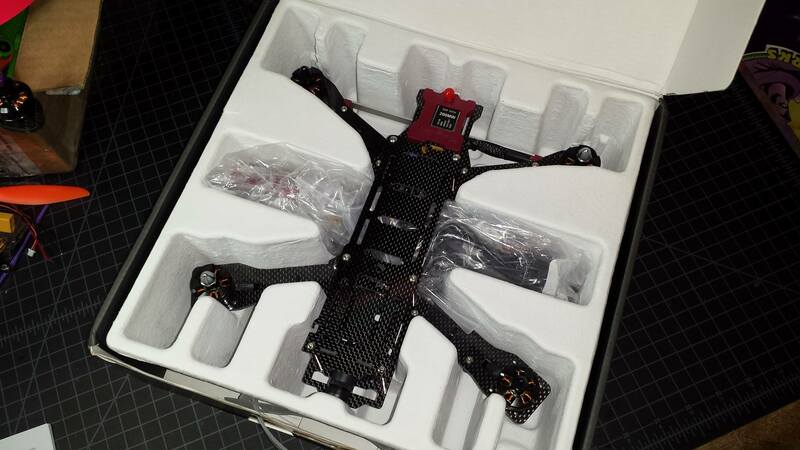 May just take the video gear off and fly it LOS for some acro fun that way. The only issue with that is that the bolts for the arms go into the pillars for the top, but 4 nuts should solve that. So...how's it fly? I can't really say just yet Last night I tossed the first RX I could grab onto it which was a 6ch LemonRX DSM2 feather light it was enough to do some basic setup and do a test hover in my backroom. But the failsafe on that RX isn't really suitable (throttle only and it just goes to the value throttle was at when it was bound...I can't get my orangeRX DSM TX module to go lower than 1027 even with my endpoints at 125% so getting it down below 960 or so where I like for failsafe is proving...tricky. I have a few ideas to try though.) So I either have to get that RX to go lower on failsafe or whip up another of my homebrew RX's before I'll feel safe flying this outside. The other issue is that despite being an ARF there's no stock tune on it. It comes with the latest version of Baseflight pre-flashed (July 11th it reports) but the PID's are all baseflight stock defaults. I was really expecting emax to include a base tune, but the instructions even say to calibrate the ESC's before the first flight. Also a little disappointing is that while they advertise the ESC's as having damped light and oneshot they don't have oneshot enabled by default. That was as easy as ticking two boxes in BaseFlight - but again I kind of expected it to ship with that enabled. One thing I did notice once enabling oneshot is that these are apparently AVR based ESC's - the older simonseries were silabs so that kind of surprised me. How do I know they're AVR's? Because once I enabled oneshot I can hear the motors ticking a little when disarmed. AVR based ESC's do this with blheli/oneshot because they handle the PWM input through software rather than hardware and that results in a bit of noise at very low values - hence the ticking. Doesn't affect performance any but can be disconcerting if you aren't expecting it. I don't know if damped light is enabled by default or not yet nor do I know which version of blheli they're running. Just haven't had time to hook up and a programmer and see yet. 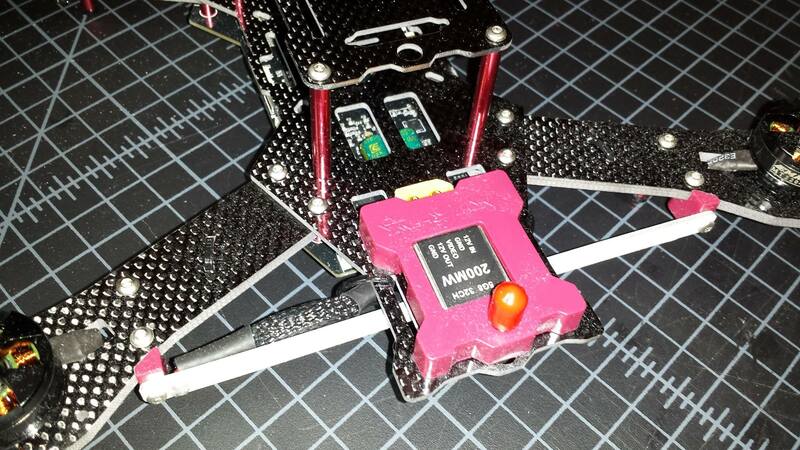 There is a 6 pin header (power +/- and 4 ESC's) for accessing the ESC's along with an included pigtail to connect to the header but it will be really nice to have BorisB's CF mods with the ability to flash/modify bl right through the FC on this for sure! The quick hover in my backroom was a little scary on the stock PID's...and because it almost wanted to take off even with no throttle I'm really looking forward to getting it outside and giving it a go! Hopefully I'll get to do just that in the next few days. I also haven't got the FPV setup working just yet. There's an error in the frequency table in the manual, the lines for FR3 and FR4 band are identical with the FR4 info listed twice. I have all my stuff setup for FR3/Ch3 - ignoring the table I just went by the switch settings shown but got nothing on my RX. 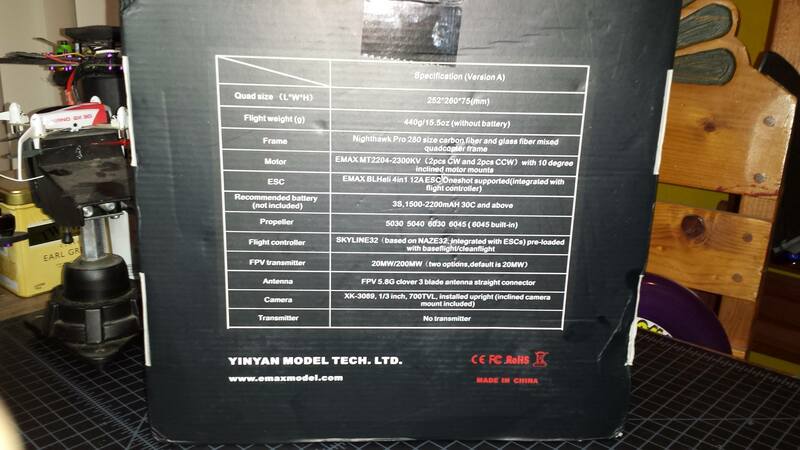 Looked up the maual on emax's website and saw that even though it's listed as "v1.0" it appears to be more accurate than the "v1.1" manual that came with mine as it did list FR3 channels correctly. It was also easier to read and revealed that I had misread the switch settings and was actually on ch5. With the settings from the on-line manual I get something...but I'm not getting a usable signal. Haven't finished debugging yet but either the online manual is also wrong or...I think they may include a PAL camera on this. My fatshark BaseSD's should be auto selecting NTSC/PAL though so I may just still be off on the channel. Just haven't had enough time to flip switches and experiment just yet. For <$200 it sure seems like a pretty nice setup for someone who wants to get into quad racing. It's ARF in that it's fully assembled. But I it would be nice to see it include a better stock tune on the build in FC. I see in the RCGroups thread on this quad that some people have posted their PID's so at least a good starting point is out there, but I do hope emax starts including them by default - I don't know if the ARF will have a better preset tune or not. The overall build quality is better than I expected for the price and the components seem well worth the price. I'm really looking forward to getting it in the air and seeing how the performance is once I have failsafe on my RX working properly. Much more to follow! I still have a lot of my own questions I want to answer about this quad and I'm sure some of you guys will have questions I look forward to answering as well. I may have a few crazy ideas up my sleeve I want to try on here as well. The FC includes a mag sensor but not a baro so GPS isn't an option out of the box - but the instructions say there is an I2C port so you can add an external baro and run GPS. I'd also like to put my OSD on here. One other odd choice by emax - they provide a port for vbat but didn't include wiring for it in the AIO so you have to run external wires. They also didn't include a buzzer by default though they do include a pigtail to wire one up. So I'll be detailing setting that up soon as well. 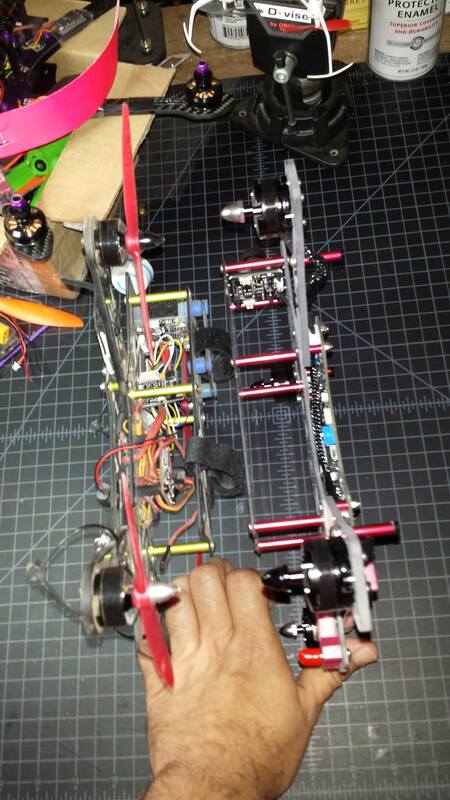 Is that XT60 glued to the frame or do you push and pull against the solder joints? Did eMAX send you a pink vtx because they know you or is that the default? Nice write up. Looking forward to the maiden. very nice review. i saw this online yesterday i think looking at frames.. and the first thing i thought if i bought such a frame.. i would make a pig tail for the xt60 as it seems that on board thing is gonna break. 2204 do weigh more than 1806 i was surprised by the two.. one looks like a penny compared to the quarter. heh. i think your weight is coming from the arms and motor.. g10 is heavy. i do think the protection is good.. but damn man.. that is over kill i think.. i would have to take them arms to my belt sander i think. heh. also, i hope t he vxr in the plastic is more protected but sounds like its not.. and just a easy way to add it for assembly.. i personally like boxes to protect stuff.. like cc3d box, etc.. just cause the rocks here are bound to do damage. heh. 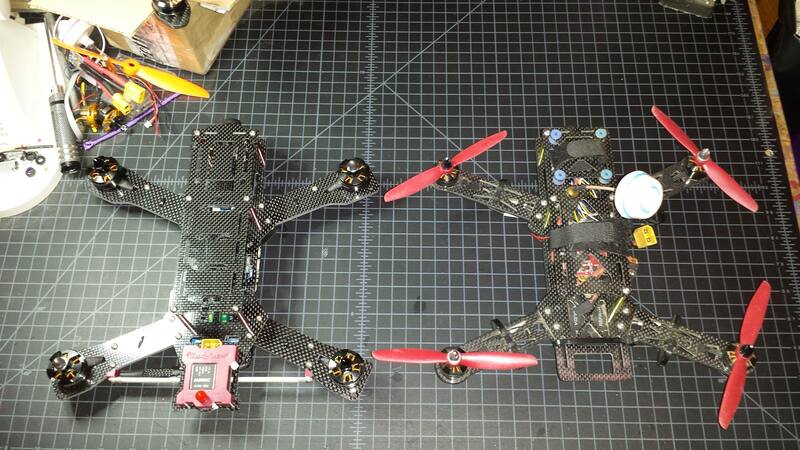 seems like this has the making to be a nice quad tho.. and not much more over a kit. and for some who are afraid of soldering etc it would be a good choice? look forward to your future feed back. Not sure yet, since I haven't had the frame apart I can't say for sure how it's in there. 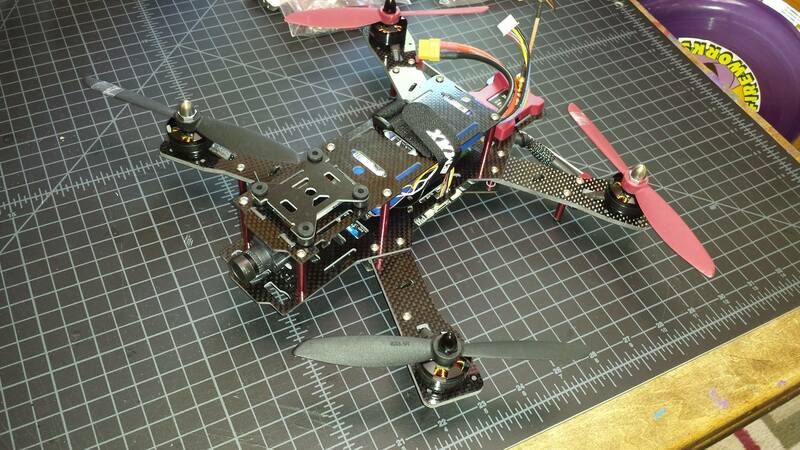 Will be taking a look at that after some flite tests when I take it apart for a closer look. Good review Jhitesma! Looks like a fairly good quad for those who want to try mini quads without putting in the time to customize and build their setup. I'm wondering what those mystery props are. Can't wait to see how it performs. The other issue is that despite being an ARF there's no stock tune on it. It comes with the latest version of Baseflight pre-flashed (July 11th it reports) but the PID's are all baseflight stock defaults. Sounds like you have the opportunity to find the perfect tune for this quad and to share it with the community. Let Emax and/or the forum know, then everyone who buys the kit will be recommended to use "Jhitesma's PIDs" for the best results. the perfect tune. starts to dream. heh. I'm not that concerned about it. Someone fairly well known for making things tough is doing the same thing. Well, the 250 is CF veneer over G10 as well. Same material. So other than the extra bulk there shouldn't be any difference from material. Yeah, that's the one big weakness that's jumping out at me. I'll probably take that off tonight to get a closer look at it. Should be fairly quick and easy to do. 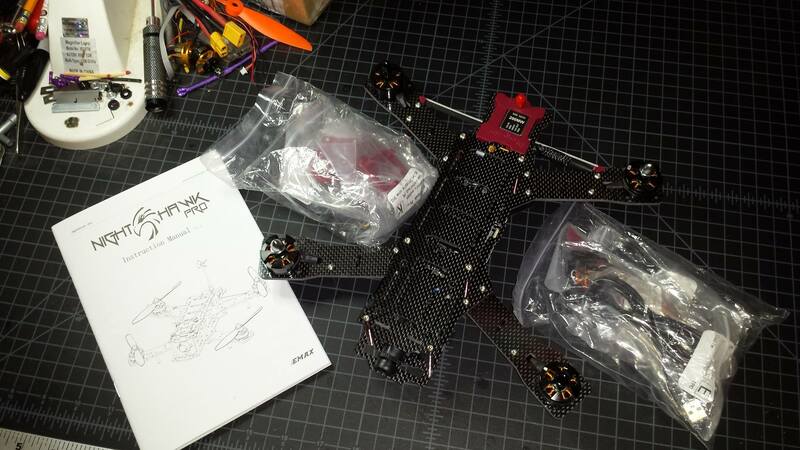 Exactly, seems like a good frame and good parts for the price - for someone who wants to fly and not build there's a lot for the money here in a good package. The AIO board makes for a very clean setup. It does need some setup and tuning...but the lack of building does make it attractive to someone scared of a soldering iron. yeah i noticed the alien using that pcb xt60 mount too.. and i still think that is the only thing i do not like about that frame. heh.. i know who am i to say that. but i would make a pigtail for that too i think.. maybe im wrong and it can be made durable i just think wear and tear is bound to break such.. but we will know soon enough if they have a problem it will be fixed on his next run im sure. I followed the link and got a good look at that AIO board. 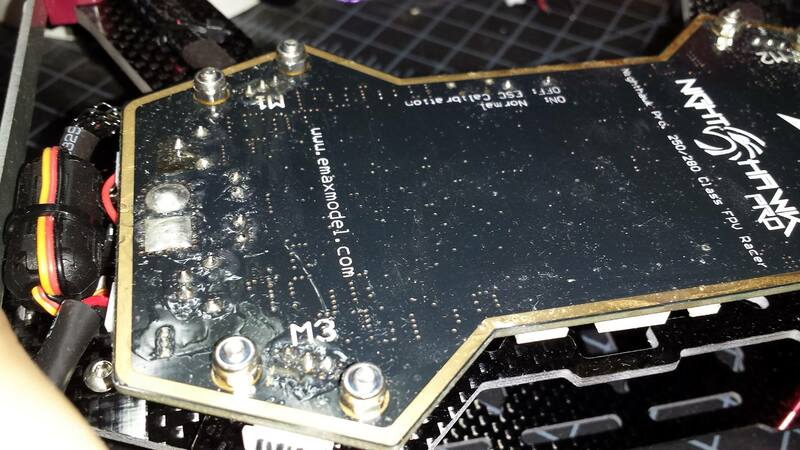 It doesn't look like you can replace an ESC if you smoke one but would have to replace the entire board. Am I seeing that right? I was unable to find a replacement board at Gearbest. Hopefully breaks of that board would be rare but I am kinda nervous about putting all my electronic eggs in one basket. That board does make for the cleanest build ever though. I don't even see any jhitesma standard rubber bands on it yet. 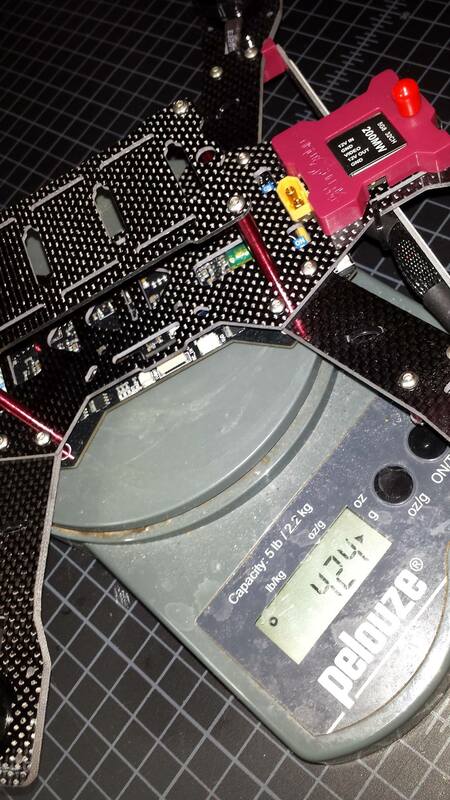 yeah it is a clean.. i think you are right about weight coming from the pcb tho too.. here are two pictures. so i guess this is one of them.. when do you stop adding to a pcb. i sure like clean builds like everyone else.. but replacing parts seem like the norm for this hobby. if the part is not to expensive, and easy to replace.. no big deal.. but if it has esc on board you are right.. something to be concerned but i do not think it would be a deal breaker considering who this is aimed for..
the noob right, but then i guess maybe that is even a bigger issue, why make something you know could break when your aimed target is gonna crash more than a vet. time will tell.. its fun to think about tho. 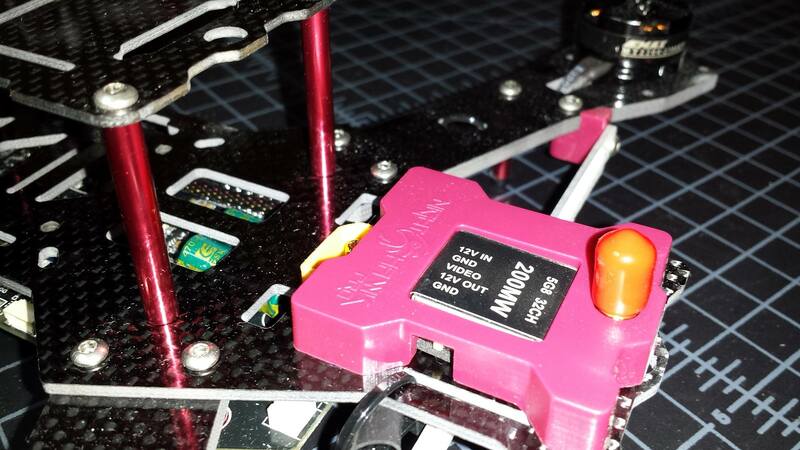 Correct, the ESC's are integrated into the board and can not be replaced. However - the signals to them are brought out on one of the connectors so it should be possible to bypass the built in ESC's and run separates. Though then you're carrying around the dead weight of the fried ESC. The AIO board definitely has it's pluses and minuses - it makes for a very quick very clean build with no soldering...but makes replacing individual components harder and limits component choices. Short of doing something modular like the colribi which then adds extra weight and more points of failure (connectors) there isn't really a good way I can think of to get the best of both worlds. 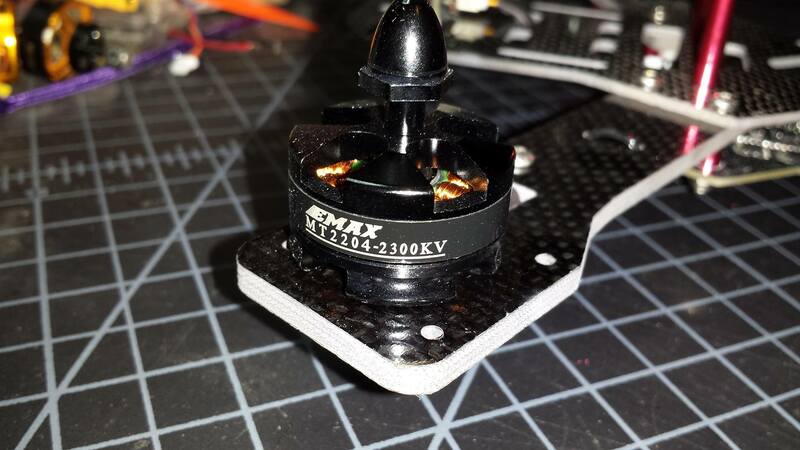 The Vortex keeps the ESC's separate but that results in more wiring and a slightly less clean setup - but gains you more flexibility. I don't think this is aimed at experienced racers, it's aimed more at people who want to get their feet wet. And for those people there's a lot to be said about the simplicity of an AIO board like this. Though at the same time a better default tune would be very nice for them. The board looks heavy...but those connectors don't add that much and neither do the switches. It's hard to tell from the photos but they're all TINY. 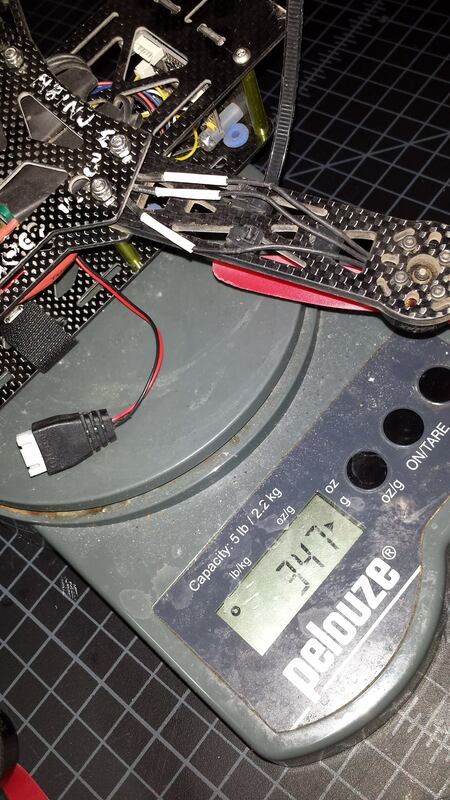 The connectors are the same as those used on the BrainFPV, Sparky2 and some of the new F3 CleanFlight boards. And you don't have heat shrink, wires, or individual PCB's for all the components so there should be overall weight savings due to the board. I suspect the giant arms and 2204 motors are the bulk of the weight difference. I don't think there's much to worry about as far as breaking the AIO board in crashes. 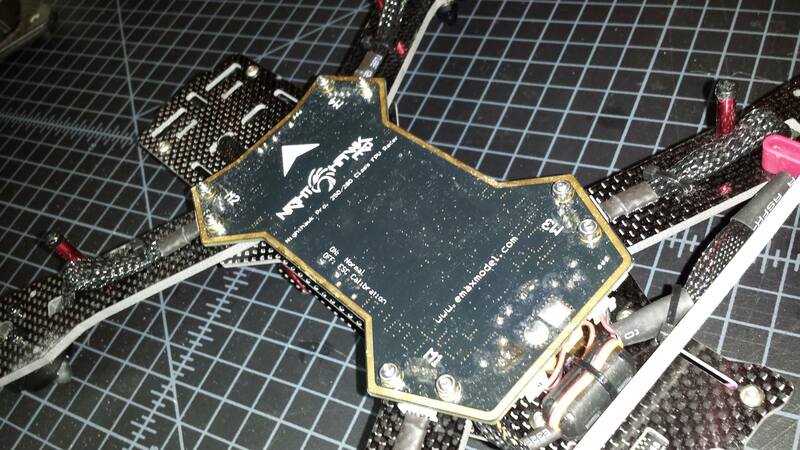 MassiveRC has a 250 nighthawk build with a PDB that he's trashed hard and has never damaged the PDB. Heck lots of builds with PDB's and seldom do they get broken. The bigger concern is frying an ESC. Though as I said the signals are brought out on a connector so bypassing isn't impossible. And with the stock parts the ESC's should be ample. 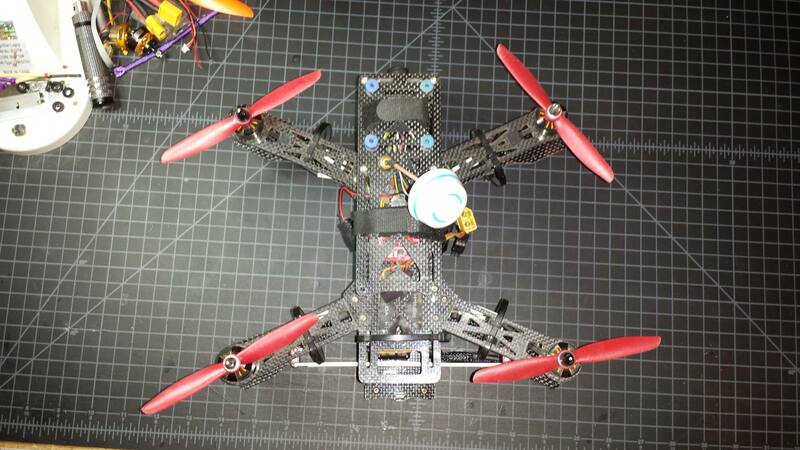 The problem will be with people who don't read the instructions and go to 4s but stick with the 6" props. 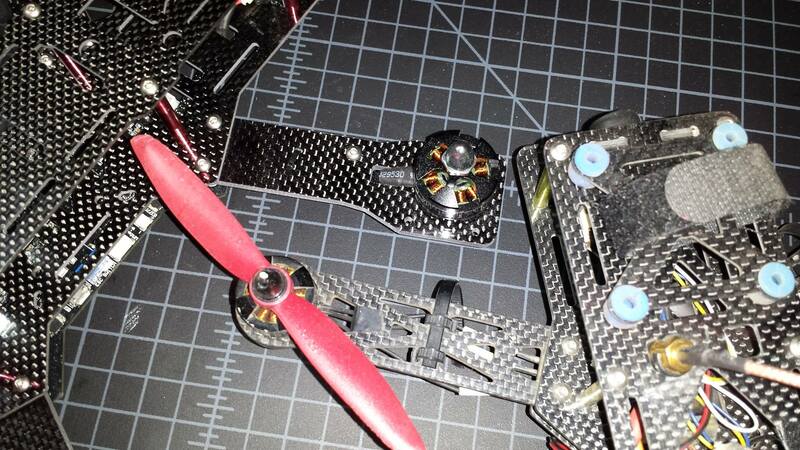 Or start swapping bigger motors or other changes that push the ESC's past their limits. So over lunch I gave it a quick "mini-maiden" didn't even have time to grab my video camera. Basically got my DIY FlySky PPM RX on it and confirmed failsafe was working then took it out for what I knew would be a less than stellar quick test on bone stock PID's....in 10-15mph winds. The tune as expected is absolute rubbish at this point. Rates are way too slow and P gain's are way too high. So it was very unresponsive and sluggish, extremely floatey as well so I suspect damped light isn't enabled by default. Didn't feel like damped like was enabled at least. Also didn't have quite the kick I expected for 2204's and 6045's. But I was flying with a horribly heavy 2200 on it because that was what was charged and within arms reach. Should do a lot better with a smaller pack. On the upside it was far more stable than I expected. Even in acro mode with the gusty wind I was able to hover hands off at about 3/8 throttle. I actually thought I may have enabled horizon or angle by mistake it was so stable - but confirmed it does hold an angle once tilted. Just the I and D terms are so high by default it really wants to hold it's position and not move. sounds like a good way to spend a few mins.. i wonder what kind of props it came with. Dal? look forward to hearing more about this.. i have a feeling there are gonna sell quite a few for the price. 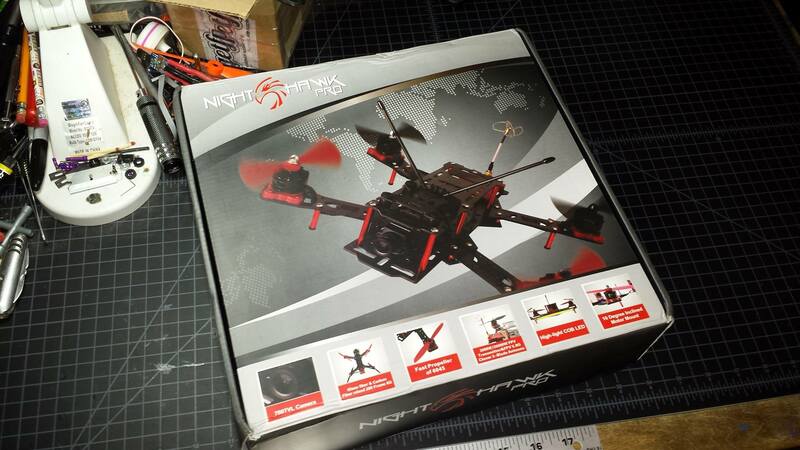 and it seems every multirotor eshop i go to is selling it. Did a bit of digging into the ESC's tonight. Apparently the ESC switch doesn't cut power to the ESC's...it seems to actually cut power to the flight controller circuits as the lights from the FC go out when I flip the ESC switch. I thought it turned off power to the ESC's from what the manual said...guess that's just the chinglish causing some confusion. 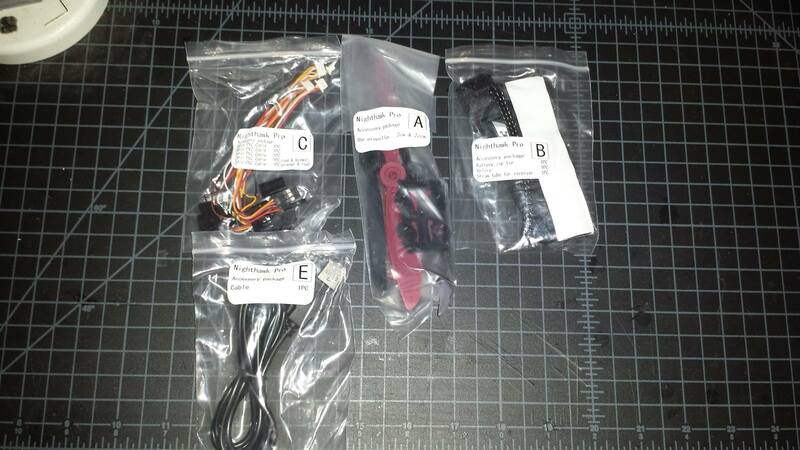 I hooked up my blheli one wire interface but couldn't get it to talk to the ESC's through the ESC header. Did some reading in the RCGroups threads and found that apparently emax has yet again used a modified version of blheli that can use stick commands but won't talk to blheli suite...grumble grumble. So I used the motor test master slider in BF configurator to reprogram the ESC's. emax claims that the "brake" setting enables damped light...so I went ahead and enabled that, changed the PWM from 8khz to 22khz (though I hadn't heard the 8khz whine that the old simonseries ESC's did at 8khz) and disabled the LVC. Haven't had a chance to test fly it with those settings just yet though. We'll see how it does with the ESC settings changed first. I'll probably try and make a quick video of how to do that as well. Basically you just hook it up with USB to power the FC circuitry - start the configurator and bring the master motor slider to 100%/2000 then plug in your battery - and from there just use the master slider like a throttle stick to program the ESC's. Still suspect it will fly a lot better tomorrow now that it should have damped light enabled and the higher PWM rate on the ESC's. Then I can dig in on a tune. who only goal is to make bheli code better. shrugs. also it should be easy to take apart since its just unplugging plugs, and a few screws. i do not see any major solder joints that need attention in the photos. 1) They want to have stick programming that matches their other ESCs and their programming cards and they don't want to deal with features like closed loop. So they strip out the less used stuff like closed loop and use the extra space to simplify the stick programming commands to match their desires and enable use of their programming cards. 2) They probably have a corporate mindset of "if it's got our name on it - it needs to be ours" so they feel compelled to make changes and "mark their territory". I do know that after it was first confirmed that the simonseries emax esc's were in fact running blheli the main author of bl contacted emax and emax has since published their code and contributed back to the main project. So they are being good open source citizens even if they maintain their own customized version of things. No soldering at all on the thing - at least none that any user would normally need or want to touch. Just unclip four motor connectors, remove 8 nuts - and the AIO should come right off. But I want to fly it as received more before I go doing that Even if I only took photos and put it back I'd feel like I somehow compromised my testing by pulling things apart. I really want to see how it does as assembled by the factory and if I go undoing nuts and re-assembling it before flight then experience an issue I'll also have a question in the back of my mind "did I mess something up when I too it apart" even if logically I know I didn't. Really windy this morning and had work e-mails waiting for me before I was out of bed. So...no test flight just yet. Hopefully over lunch or after work we'll get in a proper maiden.